The Indian markets have given positive return over 25 per cent in the year 2012 supported by the government’s intent to back reforms. If we seek expert opinion for stock market in 2013 than most of expert are bullish on market performance for 2013. 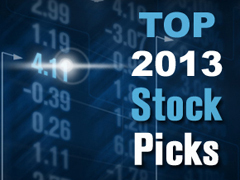 Keeping this thing in mind we have compiled stock recommendations from market expert for the year 2013. Ace investor Rakesh Jhunjhunwala is of the view that India is in a long-term bull market and expects retail and agricultural sector to be the next big growth story for the Indian markets in the coming years. Jhunjhunwala sees growth opportunity in agricultural-based companies such as Rallis India. He is of the view that food demand is going up year-on-year, but land seems to be the limiting factor. Jhunjhunwala also sees Titan Industries as good stock and it may deliver a growth of 18-20 per cent p.a. Titan Industries has given a year-to-date return of nearly 65 per cent. Ajay Bodke of Prabhudas Lilladher says the RBI should deliver atleast 25 bps rate cut in January meeting. “Hence, we are recommending investors to look at some of the interest sensitive names. We are looking at upgrading Punjab National Bank as a buy. We continue to accumulate the other biggies in PSU banking space like SBI , Union Bank of India , Bank of Baroda and Bank of India ,” he adds. In 2013, he says, one has to balance interest rate sensitive with defensives. “One will have to also have certain part of the portfolio in defensives. It will be a mix of the two. On the defensive side, sheer valuations make us positive on some of the ITs like Wipro and Infosys . In the pharmaceutical side, we continue to be very positive on Dr. Reddy’s Laboratories and Ranbaxy in the largecap names,” he elaborates. Shankar sharma sees growth opportunity in FMCG and Pharma Stocks. Sharma is positive on Hindustan Lever, ITC and Bajaj Auto as these are some of the stocks which have kept their head above water. Pharma is another space that he is positive on; although they are a little expensive to start with. Although it’s very hard for multiples for pharma companies to expand beyond 20-25 PE and earnings growth for the sector will not going to be like 40-50 per cent, it was more going to be like the 20s or even in the high teens. Tulsian is betting on United Spirits , Radico Khaitan , SKS Microfinance and Suzlon as his multi-bagger stocks.